Even the best SEO company in India would say, that being the traditional search engine and the preferred choice for most people, Google holds an indomitable place in the market. But then, there’s Facebook too. It is one of the biggest social media platforms we have today, and it is quickly establishing itself as the next big search engine as well. So, what should businesses do? 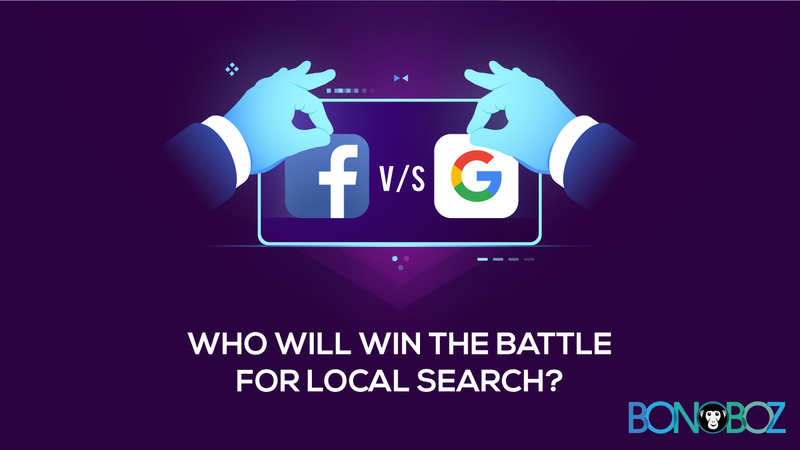 Depend on Google as it holds most of the market share, or start accepting Facebook as the next big player in the field of local search? To answer that question, let’s take a look at what both these platforms bring to the table. Answering more than a billion questions every single day, Google has established a massive foothold in the industry; its name today is the synonym of online search. As any SEO company in India would tell you, it’s a humongous task for any company to try to undermine the market-hold of a platform like Google. It offers fantastic local search results; these results are given a search page ranking which is based upon- various review sites, local media and citations, in addition to its Social Media platforms. So, it’s a good system that has a lot of resources belonging to a wide range and it continues to improve itself, making it a priority to ensure that users only get answers that are truly relevant to their questions. The real downside and the only one, of doing a local search on Google is that users mostly get recommendations from strangers – people they don’t know at all. Say, you’re looking for the best restaurant anywhere in India, and an SEO services company in India tweaks a little, maybe by putting out fake reviews as a part of their SEO services – you will find the search results for that restaurant business skewed in their favour. It renders the search results cold and impersonal in nature. We know that Google search result algorithms take into account your behaviours and your connections with other people as well as websites, all over the Internet. On the other hand, Facebook’s Graph Search makes things even more personal by first and foremost taking the online behaviour of your friends into consideration. It basically keeps track of user behaviour for everyone on Facebook. So, if you go to a cafe, and thereafter ‘check in’ and like its Facebook page, the algorithm will graph these exchanges. Later on, when one of your friends on FB asks Graph Search to tell them what cafes in the city do their friends like the most – it will show all the cafes that you gave a Thumbs Up, in the search results. When graph search is unable to find the needed data within your own groups, it takes Facebook and its community into account. So, by the means of just a few keystrokes, you can have Facebook get you recommendations from some of your most trusted advisors – your friends. There is a marked difference between the way you’d ask Google a question and how you’d phrase a query for Graph Search. While on Google you type, ‘Best cafes near me’, the latter lets you ask ‘What pizza restaurants do my friends like in [insert the name of your city]’. Looking at both the phrasings, one usually finds Graph Search query to be a little less impersonal compared to Google. Moreover, most of the results on Facebook come from people that you already know; that’s another reason you might feel duped by a Google search result, but not by a Graph Search. So, speaking from the point of view of an SEO expert agency, the ultimate difference between the two comes down to the data collection – while Graph Search does not go beyond your community of Facebook friends, search results on Google are based on information that’s obtained from all over the web. The challenge here is that people still see Google as their go-to search engine. Facebook isn’t where generally one goes to make online queries. Changing consumer behaviour that has long since been prevailing, would be a great challenge. And what happens when your friend has a bad experience at say, a store, that they previously liked on Facebook, or what if the store closed permanently but the FB page is still intact? Your Graph Search result would still point you towards the same store. An SEO expert solution here, therefore, is to have a better mechanism to weed out stale information. What Should a Business Do? Being a business owner, the best thing to do would be optimizing your online presence for both Google as well as Graph Search users. Even if people still view Google as their traditional search engine, you have to give it to Graph Search for at least having improved things for Facebook since its previous search tool. We’ve been using Google since so long that we can count its pros in a minute. But, Graph Search though in need of some issue resolution, provides results from only those that we know and trust, making it quite an efficient system.